Great Great Great Grandfather Govind Sathe. Great Great Grand Father Atmaram Govind Sathe: was martyred (most probably at Bithur) during the First War of Independence 1857.Was one of the “Sardars” with Nanasaheb Peshwa. Great Grand Father Hari Atmaram Sathe: After the family’s rout during 1857, somehow managed to get back to Kokan. Having restarted life of the family which was badly mauled and devastated during 1857, did his engineering, and served with the earlier form of what is now known as MES. Grandfather: (No 376 3/CL SAS) Subedar Shripad Hari Sathe, “Bahadur” OBI, IMSM, IMD .Born on 18 Dec 1886.Entered service on 14 September 1915.Awarded IMSM for services rendered in Egypt during WW 1.During WW1 was serving in the Indian Subordinate Medical Department which became Indian Medical Department in mid 1919.He received his OBI Second Class with the title “Bahahdur”, with effect from 01 January 1943. During WW I (“THE GREAT WAR FOR CIVILISATION 1914-1919”): Served in Egypt, Mesopotamia, and turkey. WW II: Served in Europe and once again in Egypt and North Africa With the 4th (Red Eagles) Indian Division under 8th Army commanded by Later Field Marshal Montgomery. Was fully involved in the siege of Tobruk. Won OBI during the break out of this seize! Father: IC 691 Major Parashuram Shripad Sathe RASC and then AD. WW II: Took part in the retreat from Burma from Rangoon right up to Imphal. And then as the battles swayed to and fro, got back to Rangoon, under the renowned 14th Army; GOC-IN-C Being “Billy “Slim, later Field Marshal Slim. onward to Indo China, through to Philippines and were preparing to land at Japan. After the twin Atomic bombing on Hiroshima and Nagasaki (06 and 08 Aug 1945 respectively) and immediate surrender by Japan, got back by sea direct to then Calcutta. 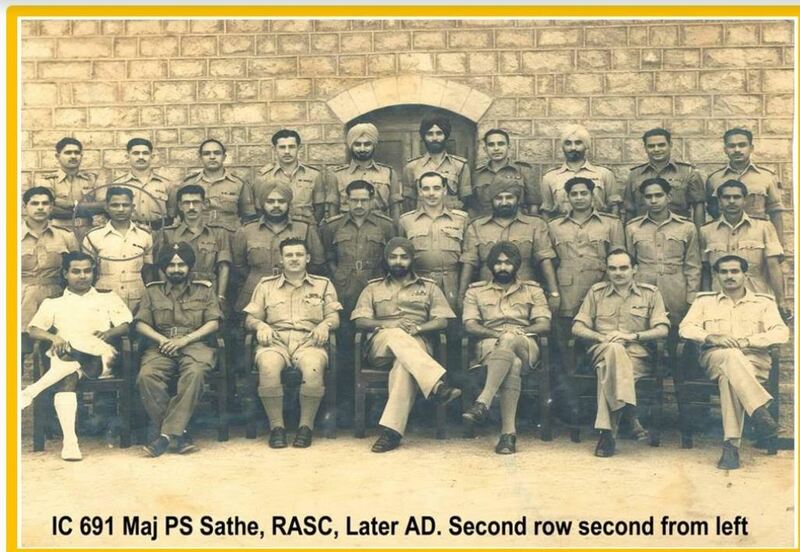 Self: IC 17386 F Maj Uday Sathe, VrC, MGP: Regiment of Artillery (From the Famed Mountain Gunners’ Family). Had the unique privilege and distinction of carrying the guns on Mule Pack, as towed; and then in Helicopters across the Padma and Meghna Rivers of then East Pak and now Bangla Desh. The ONLY Gunner officer ever in the History of the Indian Artillery to do so. NOT a double but a triple whammy one can say, or if you like a Hat Trick! Had the great fortune and honour to carry the sword for “Bharat Mata”, with fearless audacity and a blood and guts attitude; during the liberation of Bangla Desh in the 1971 War against Pakistan. The points touched and battles fought during the “Official War”: Salda Nadi, Broken Bridge near Fakirmora, Akhura BOP, through Sanmura crossing of Gomati (guns on mule pack), pre dawn attack on Chandina, achieving total surprise. “Leg up in the air” Dash to Elliatganj (Guns in towed formation), breaking out through Elliatganj in broad day light, and with blood curdling cries attacking Daudkhandi almost at dusk and the was the “Finest Hour”!Won VrC on 06 Dec 1971 at Daudkhandi, and gave battle Honours to 12 Kumaon. All in a Day’s Work! Flew over the Padma Meghna Rivers in Helicopters (Guns In heliborne Formation), landed at dusk at Baidar Bazaar, engaging enemy at 0200 hrs in the Morning, and with swash buckling élan smashing through Narayan ganj. Onward to Adamji Jute mill, and then all of sudden there was nothing left to conquer as when My GUNS were trained on Dhaka, the Cease Fire was declared, and now there was a deafening silence, and then there was all quite on the eastern Front !